For an immersive experience, how about 3D (360° or “sphere”) photos where the viewer can scroll around the table or room? In my view, from a marketing perspective the single biggest impediment to mass adoption of bridge, is the total lack of household name or “celebrity” involvement. 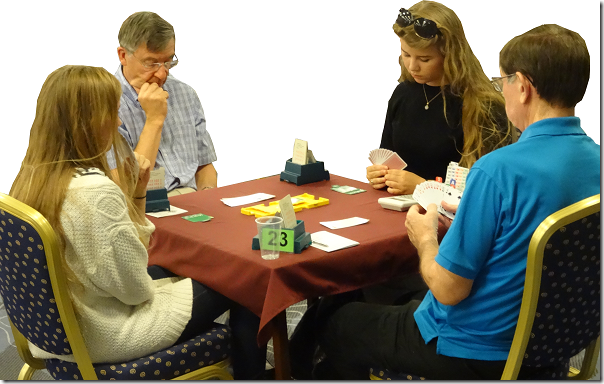 A few non-bridge players may know Bill Gates plays bridge, or even Warren Buffet. But these characters are certainly not in the league of Omar Sharif. Bridge was more current, more in the news pre-80s. Possibly the fame and controversy of the Italian Blue team, Terence Reese etc helped keep things in the news. Bridge had respect as a game amongst lay people. Does it now? Thanks for your comment. The 360 is a nice idea but I am thinking of photos to put on leaflets, ads etc. Celebrity endorsements and news stories help, but we find that wherever an opportunity to learn bridge is carefully advertised, a lot of people do come forward. That suggests we can increase the number of people playing by tapping into this latent demand.